Oh, something’s just slinked out of our in-house time portal, smoking and cold to the touch. What could it possibly be, you remnant of the past, you shadow of a memory? 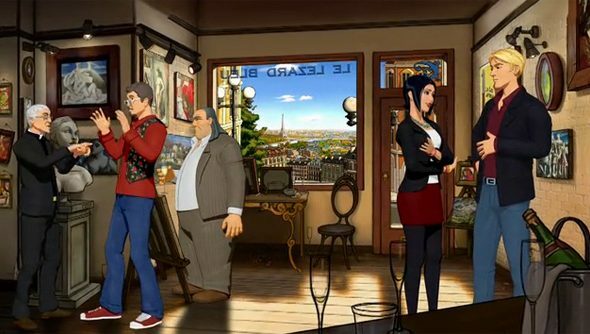 My god, it’s a Kickstarter for a new Broken Sword game! By Charles Cecil and the original team! In two dimensions! Thank you, magnificent time portal. Broken Sword: The Serpent’s Curse is already six months into development at Revolution Software, with the cash raised by the Kickstarter funding the completion of the 2D adventure – the first entry in the series since 2006. Revolution have already raised thousands towards their $400,000 goal, in mere minutes, with backers receiving bonus materials such as signed game design docs and scraps of lovely artwork. The fifth Broken Sword game reintroduces the Indiana Jones meets Jonathan Creek styled George Stobbart and his “sassy” journalist sidekick Nico Collard, as they uncover conspiracies by flirting at one another and occassionally falling down holes. Donate $10,000 and you’ll get an in-game portrait that will be commented on by the pair – probably something faintly sarcastic and fourth wall breaking, I imagine. Here’s the game’s Kickstarter page, which has an incredible pitch video. If the fundraiser is successful, the adventure game will be coming to PC, Mac and telephones. It’s like Who Framed Roger Rabbit? except with way more Charles Cecil. The man certainly knows how to make us open our wallets.